Kindergarten through Fifth Grade is a strong single tack with one class per grade with core subjects structured for smaller group learning environment. Reading: Students in the elementary grades are separated into ability groups in reading. The Wonders series by McGraw Hill is used primarily for instruction. Trade books are also used as part of a total reading program. Language Arts: Language Arts in the elementary grades incorporates spelling, phonics,writing,and grammar. Students learn to write paragraphs, diagram sentences and give short speeches. Math: Saxon Math is used for daily math instruction. Saxon Math involves teaching a new concept every day and constantly reviewing old concepts.This spiraling approach to teaching math promotes long term mastery of concepts.At the primary level, all new concepts are developed through hands-on activities. Students move from the concrete to the pictorial to the abstract. In math, students develop number sense beginning with an emphasis on basic math facts. Manipulatives are used in mathematics to facilitate concept development and logistical reasoning, and to apply mathematics to problem solving. Science: Students in the elementary grades explore science through visual, hands on activities. Students conduct experiments and learn about the scientific method. 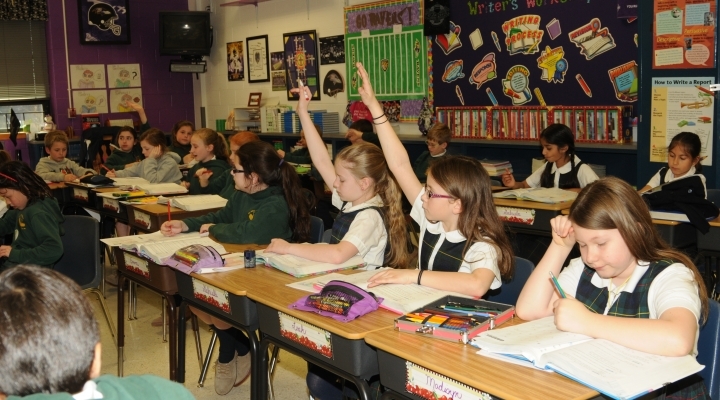 Harcourt School Publisher textbooks are used to reinforce the Archdiocese of Baltimore curriculum. Social Studies: The Social Studies curriculum prepares our students to understand and participate effectively in an increasingly complex world. Scott Foresman Social Studies encourages students to think critically about key concepts—through reading, hands-on activities, and technology—so they actively experience the world they live in. The 3rd grade Wax Museum and the 4th grade trip to Annapolis are some highlights in the elementary program.